Jakarta’s MP3EI economic masterplan launched last year is promoting large-scale private and public sector projects with scant regard for human rights, environment or climate impacts. It involves developing large energy, infrastructure, industrial, and agribusiness projects across Indonesia. For communities on the ground, MP3EI means more of the same kind of human rights abuses and environmental destruction experienced under the Suharto regime. This is because there has been very little progress on protecting indigenous peoples’ rights or on reforming laws relating to land and natural resources since then. 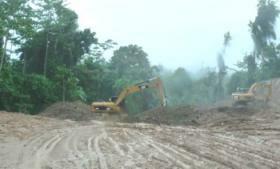 As a result, conflicts over land abound, as communities attempt to defend lands and livelihoods from oil palm plantation developers, mining and logging companies and agribusiness developers, some of whom enjoy financial backing from UK investors. For example, Archipelago Resources is a UK company involved in conflict with communities over its gold mining operations in North Sulawesi. Meanwhile destructive development in Indonesia is being supported by UK and EU policies creating demand for agrofuels, including Indonesian oil palm. UK-listed companies involved in unsustainable resource extraction in Indonesia include BHP Billiton, and Bumi plc which are both involved in large-scale coal extraction projects in Indonesian Borneo. Bumi and its Indonesian shareholders have been associated with numerous human rights and environmental abuses, including a brutal attack against striking workers at the KPC mine in March this year. Jardine Matheson, which controls major palm oil companies operating in Indonesia, has been accused of causing deforestation and biodiversity loss. In Papua, the large military presence, the climate of impunity for human rights abuses by the security forces and restrictions on civil and political freedoms means that the impacts of land and resources appropriation are even more severe for the local population. Human rights abuses, including killings, are commonly associated with logging, mining and oil palm plantation ventures, while additional problems associated with in-migration from other parts of Indonesia are increasing the pressure on indigenous Papuans and their resources. Two UK-listed companies, BP and Rio Tinto, are heavily involved in resource extraction in Papua in their Tangguh and Grasberg operations respectively. Meanwhile policies promoting more fossil fuel use, the conversion of forests to agribusiness and plantations and the destruction of sustainable community-based resource use, spell disaster for the climate and undermine the President’s international commitment to reduce greenhouse gas emissions by at least 26% on business as usual levels by 2020.
ensure that UK Government policies, programmes and support for British investment in Indonesia answers the call of civil society in Indonesia for climate justice and respects the rights to resources and livelihoods of Indigenous peoples and local communities.